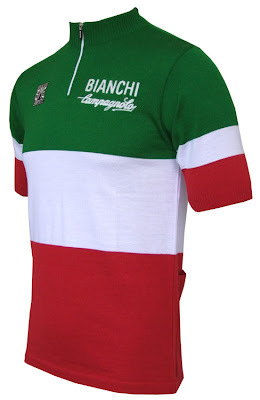 The Felice Gimondi 2011 Gran Fondo wool (50% wool/50% acrylic) jersey in the Italian championship tricolore is available from Prendas in the UK. Made in Italy by Santini the jersey features embroidered Bianchi and Campagnolo logos, a 14cm front zipper, and three rear buttoned pockets. There is a Learco Guerra exhibition at the Casa di Rigoletto, on piazza Sordello, in Mantova until September 30th. 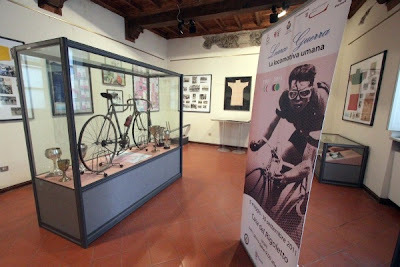 Learco Guerra was the first to wear the pink jersey of the Giro d'Italia on May 10th, at the finish of the Milan-Mantova stage, when it was introduced in 1931. He also won the World Championship in 1931 in Copenhagen. For five consecutive years, 1930 to 1934, he won the Italian national championship. He finished 2nd in the Tour de France in 1930 (wearing the yellow jersey for seven days) and 1933. He ended his career in 1942 while still dominating the middle distance motor paced events. He was nicknamed the "human locomotive" ( locomotiva umana) for his power in the flats. Jac Zwart, author of the Dutch language book "Wielermonumenten - Reisgids door de geschiedenis van de wielersport" (Cycling Monuments - Travel Guide through the History of the Sport of Cycling), contributes his eighth article, this time about a visit to Tualis. "Last month I made a trip through Northern Italy and had the opportunity to visit a number of cycling monuments which I knew existed but didn't have pictures of. One of those is located in Tualis, a 'frazione' that is part of the municipality of Comeglians, in the province of Udine. Tualis is about 4 kilometers along the ascent of the Monte Crostis. As many of you will know, the Monte Crostis would be climbed in the 14th stage of the Giro d'Italia this year, but was eliminated from the stage because the riders complained about the dangerous descent and the fact that the team cars would not be able to follow and support the riders during that part of the race. Indeed, the road appeared to be very steep and narrow. And I just climbed the first four kilometers. I didn't do the descent but I can really understand the fear of the riders. Sadly, the enthusiastic inhabitants of Tualis had planned a number of festivities to welcome the Giro: they renamed the central piazza to Piazza Giro d'Italia and they erected a statue in the form of a racing bike. Understandably, the inhabitants were not amused that the Giro decided to take an alternate route to the finish on the Monte Zoncolan, just days before this stage would take place. Still, they have kept this tribute to the Giro in place. It is worth a visit to this challenging environment for many cyclists." 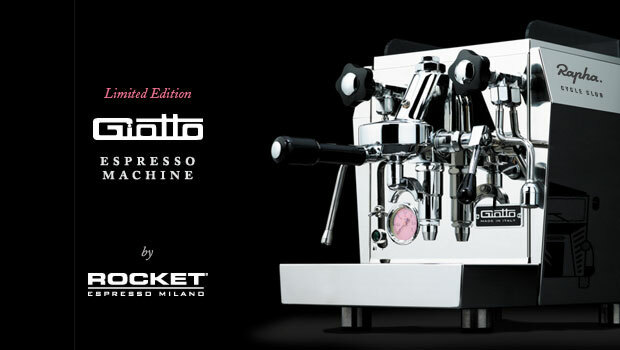 A limited edition of 200 espresso machines from Rocket Espresso Milano have been created for Rapha. Costing the same as very good frameset they even (!) 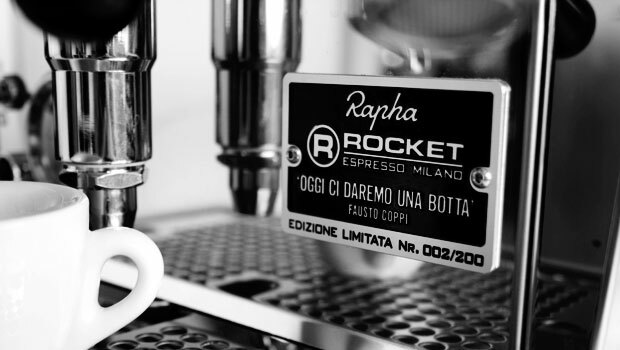 come with a quote from Fausto Coppi, "OGGI CI DAREMO UNA BOTTA". Cost: €1700; at current exchange 1,940 Euro, $2,780 (incl. shipping and duty outside EU). 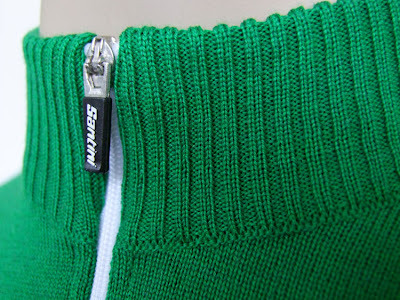 Details from Rapha here. If you have an interest in espresso machines the Rocket website is www.rocket-espresso.it. 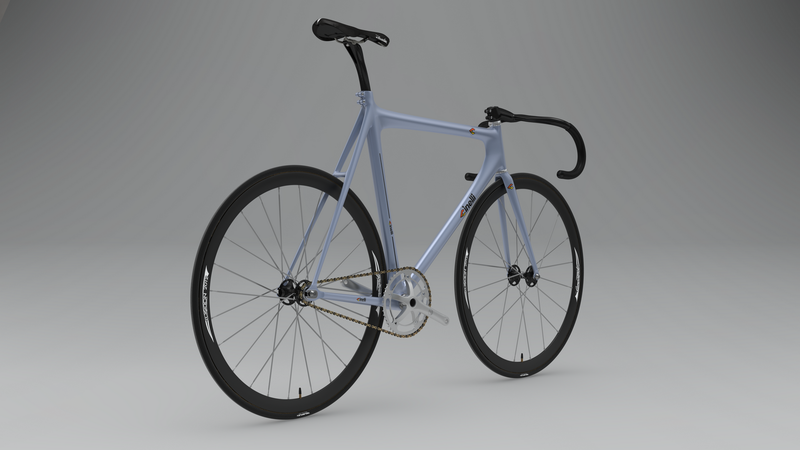 My thanks to Yann Lewandowski for writing in about his 3D project in which he conceptualizes a re-issue of the Cinelli Laser for the 2012 London Olympics. 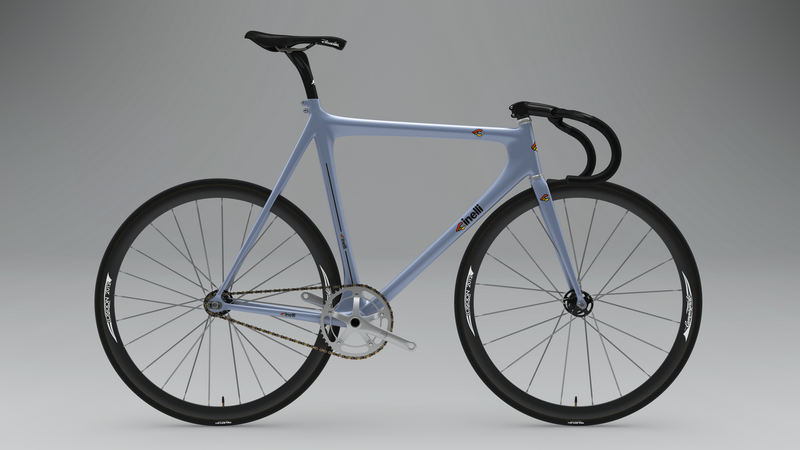 The concept is based upon, "A carbon made frameset inspired by the geometry of the classic one but update to track racing of our days". You can find more photos and a description of the project here. Which reminds me that I need to follow-up on the status of Cinelli's plans to re-issue the Laser. The finish for the the 2011 Giro di Lombardia, and for 2012, will be in Lecco. The Fall one day classic, also known as the "Race of the Falling Leaves" ("classica delle foglie morte"), will take place on October 15th. 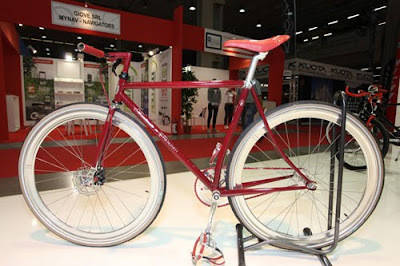 It will be the first time that Lecco will be the finishing city. Lecco is also campaigning for a Giro d'Italia stage next year. 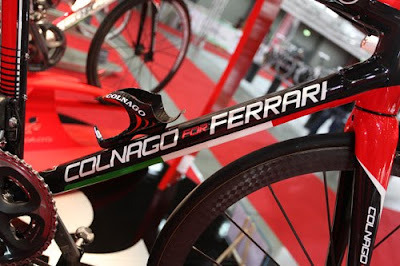 According to the announcement the finish will be rotated in the future among various cities in the Lombardy region. Photo: Michael Acquarone, who recently assumed responsibility for cycling events, signing the accord with Presidente del Comitato Elisa Corti. 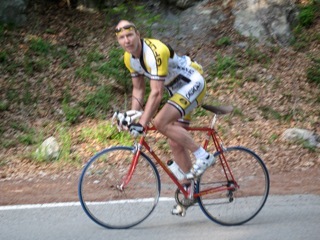 My thanks to Marco Mori for sending in this story about his search for a L'Eroica eligible bike. 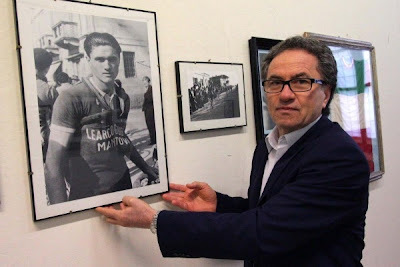 Marco's cycling passion began as an 11 year old when in 1971 he saw his first professional race with Eddy Merckx, Gianni Motta, Franco Bitossi, Felice Gimondi and many more. After a career in the travel industry he decided to start his own cycling tour operation, GustoCycling, in 2009. 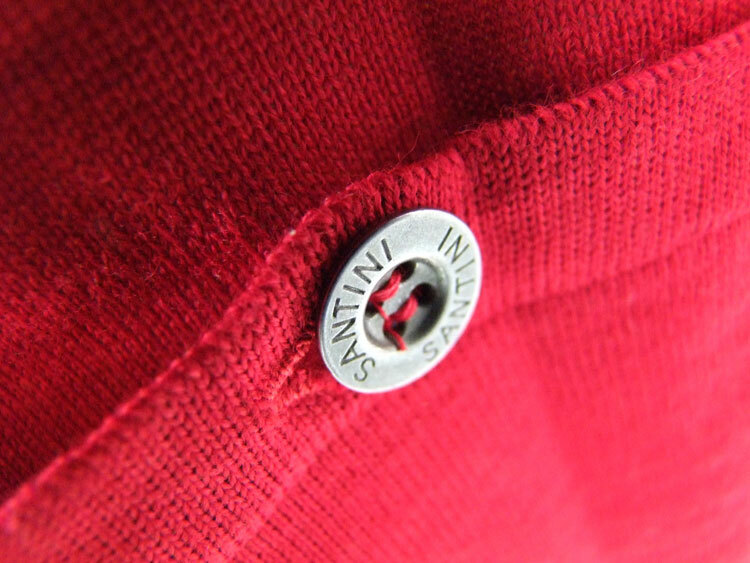 "Gian Bohan and I have been wanting to participate in a cycling event called L'Eroica in Chianti, located south of the beautiful rolling countryside of Siena. I was attracted to this event after first reading about it in a cycling magazine five years ago, I kept the feature as a reminder to myself that one day I'll go and check it out. What struck me when reading the feature was it's uniqueness, nothing quite exists or compares in the world with this one day cycle event. I realized after reading the article that not even the many E'tape du Tour or Gran Fondos that I had participated in over the years would compare with this event. by cycling on the white gravel roads of the Chianti region as Coppi and Bartali had previously done. This event has grow enormously to the point now that it's over subscribed. The success, in part, is down to key points of participation: as a minimum you need a pre-1987 bike, toe clips, downtube shifters and period cycling clothing is recommended. Many participants eagerly take up the spirit of the event and use metal water bottles, carry spare inner tubes crisscrossed around their body, use motor racing googles, and flat caps. If you ride with a moustache it's a bonus!! Two years ago while on holiday in Tuscany I decided to go and visit the event to see for myself what the event was really like. I arrived on Saturday in Gaiole the day before the event and noticed immediately a very relaxing feel to the event and place. There were many stall holders selling original Campagnolo group sets, to 1969 L'Equipe magazines from the Tour de France to Molteni/Faema racing jerseys to metal drinking bottles with cork stoppers!! 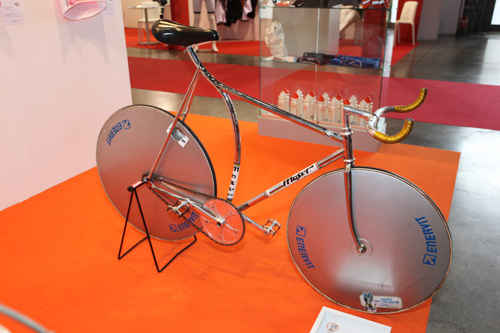 This was a real retro shopping paradise with something for everyone with an interest in the golden age of Italian Cycling. Then I bumped into my hero Francesco Moser who was a guest of the organisor, here he was still looking lean, tall and his trademark nose and chatting away with old fans. The event on Sunday was fantastic to watch...every colour, every team, (Ti Raleigh to Salvarani) every bike from (Atala to Legnano) was on show from kids as young as 16 to those in the their 70's cycling through the Chianti region. The route has 4 distances which you can decide on the day the distance you wish to participate. 40km, 80km, 120km or 200km. At every 40km there are food stations....but these are not the usual nutritional stops of gels, sports drinks and bananas!! These stalls are filled with parma ham, salami, sandwiches of the local areas, local Tuscan soup Robolitto all washed down with Chianti!! At the finish everyone receives a bottle of Chianti and panforte which is a local Siennies fruit cake! After the weekend I was hooked on the whole event! After talking about the event to friends over the next two years, we have finally decided that we would participate. Now the big challenge was to find a bike of the period to participate. 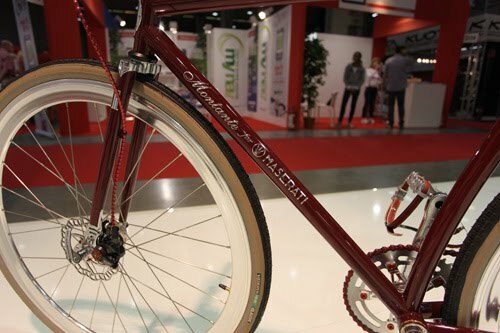 Gian and I headed for Tuscany to seek out bikes for L'Eroica, we talked to hoteliers, bike shops and even restauranteurs in our quest to seek out a L'Eroica bike and it became quite evident this was no easy search. Time and again bike shops were saying that the Italians over the years had thrown or given away their old bikes that now the one's that still exist are being kept as they realize, like old vintage cars, there is value in keeping them. A few find their way on occasion on ebay with prices now not quite cheap as one would have thought. We met a hotelier owner called Enrico, and his father, located on Monte Amiato (an extinct volcano at 1700m). 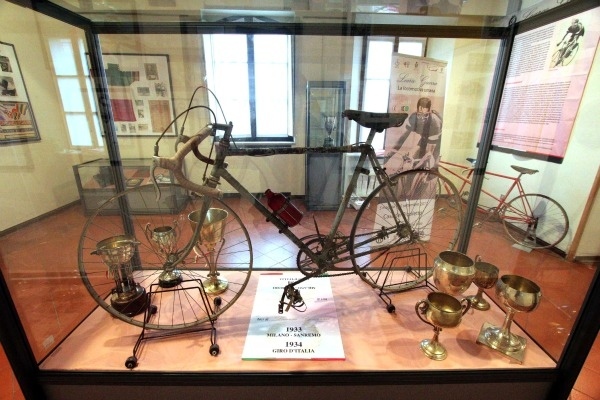 We had advised him of our interest in old bikes and he duly offered us the family's 2 Colnago's, one was a 1982 full Campagnolo Giuseppe Saronni replica bike (interestingly given as a gift by Ernesto Colnago himself as he was a regular guest of the hotelier). The bikes were in all of their original colour and components. I tried this bike (above) while Gian cycled a 1977 Colnago Sport Racer. Well!! We never had so much fun riding around Monte Amiato and the surrounding countryside. It felt like leaning to cycle again!!! The gear shifters made a tremendous thud, every time I changed down it reminded me so much of the exact sound when i used to ride similar bikes in the late 70's. We were hooked and ready to buy but the owner had left for the day and we had to move on! Chance lost!! 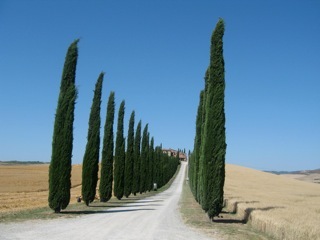 We traveled back through the beautiful unspoilt rolling countryside of South Tuscany and came across a lovely countryside restaurant in which we were the only customers but the owner Gilardo made us most welcome. We had a range of antipasto with some fine local wine and after a short sleep under a tree we were off on another quest courtesy of our discussion with Gilardo who recommended that we see his friend Maurizio in Sinalungo. When we went to meet Maurizio he was busy working on restoring a 1910 touring bike for a client. Although his shop had the latest bikes, from Bottechia and Cannodale, here he was busy working with meticulous accuracy, to verifying against old photographs, that the completed 1910 bike was correct. At this very moment I received a phone call from my friend at L'Eroica who confirmed that he would be able to let us borrow L'Eroica eligible bikes. Our quest was finished.... for now. Seeing an artisan such as Maurizio work first hand was a fitting end of our quest to find a L'Eroica bike. See you October 2nd in Gaiole!" 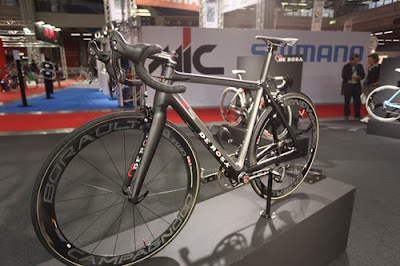 You can find Marco and GustoCycling on Facebook here. After seven years as the head of the Giro d'Italia, Angelo Zomegnan has been replaced with a new structure to manage the race. Michael Acquarone, currently Direttore Generale of RCS Sports, assumes direct responsibility for the organizational structure. 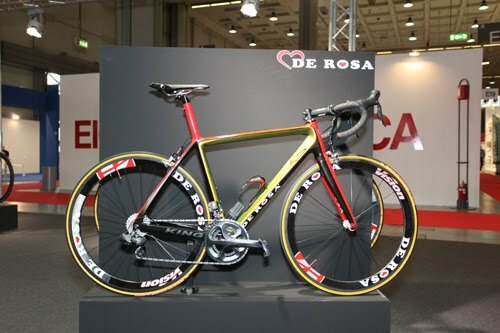 The management of the corsa rosa will be under Mauro Vegni who will be supported by two former former professional riders: Stefano Allocchio and Alessandro Giannelli. Marketing responsibilities for the Giro have been assigned to Marco Gobbi Pansana. Zomegnan was thanked and recognized for his valuable contributions in recent years in which the prestige and importance of the Giro d'Italia expanded globally. He will maintain an office at RCS Sport and will work on special projects in a collaborative relationship with the Gazzetta dello Sport. It has been reported that he will become part of the organizing body for the World Championships, Road, in Florence in 2013. Good luck Angelo! Thank you for raising the level of the Giro d'Italia to new heights. 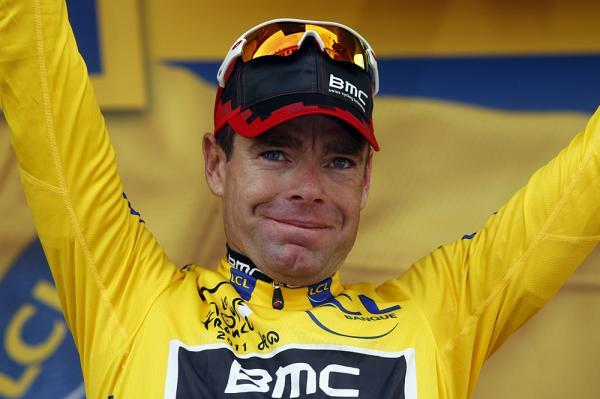 Cadel Evans (BMC) has won the 98th edition of the Tour de France and became the first rider from Australia to do so. "A few people always believed in me and they’re the people that matter the most. We did it,” Evans said. "It’s been a real pleasure these past three weeks." The 34-year-old Evans is the oldest winner of the event since World War II passing Gino Bartali who was also 34 but slightly younger when he won in 1948. 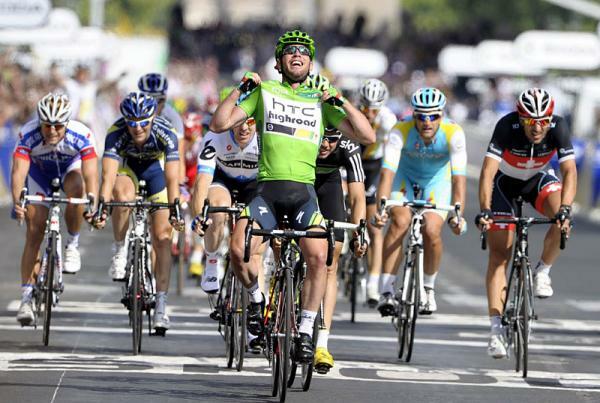 Mark Cavendish (HTC-Highroad), led by his powerful train, won the sprint on the Champs-Élysées, his 3rd finishing day victory and bringing his total stage victories to 20. 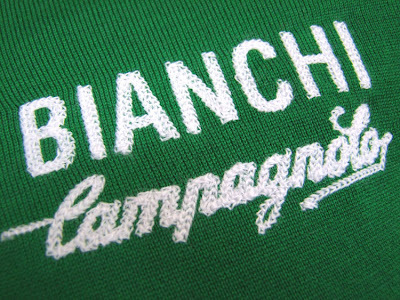 Cavendish is also the winner of the the green jersey in the points classification. "I left it until 170 meters to go today, I knew it was going to be tough,” Cavendish said. “I’m so, so happy and so proud of the guys. It’s a great way to finish the Tour. 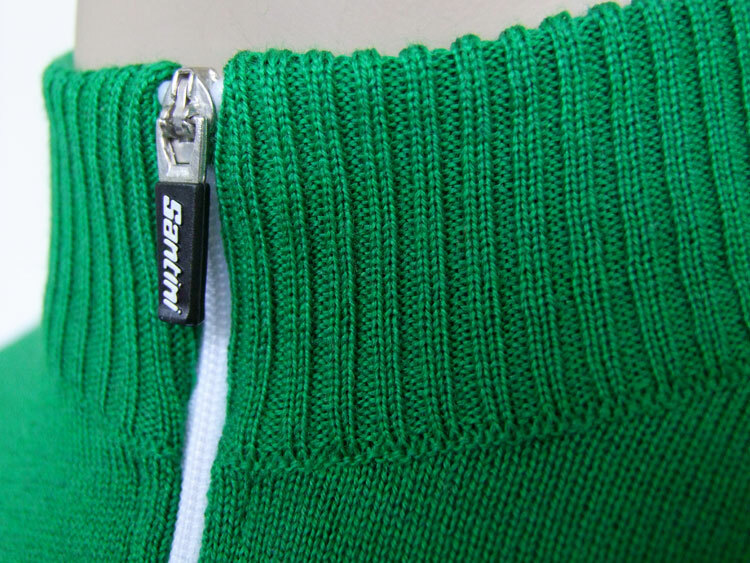 "I’ve been trying to get this (the green jersey) for the past few years and finally I’ve done it. Samuel Sanchez Gonzalez (Euskaltel-Euskadi) won the polka dot jersey in the mountains classification. 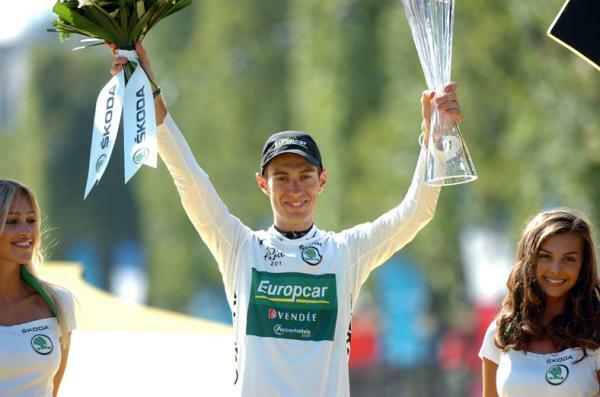 Pierre Rolland (Team Europcar) won the white jersey in the best young rider classification. 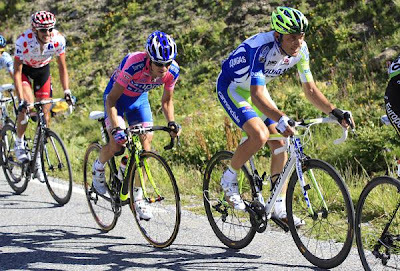 The last rider on GC, the lanterne rouge, was Italian Fabio Sabatini (Liquigas-Cannondale) who finished 167th with a deficit of 3:57:43. 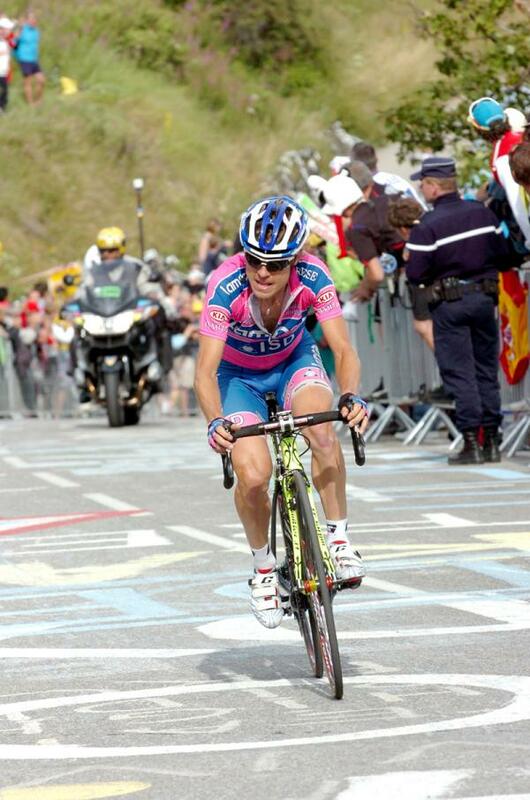 Damiano Cunego, highest placed Italian in 7th: "I am very satisfied with my Tour de France. Thanks to the support by my entire team I found myself battling with the best riders. It is an important result for me and a reward for all the training I did in order to be ready for this Grande Boucle." It was a terrific Tour. So, what is in store for 2012? -perhaps an announcement of a Tour start in Italy in 2014. The Veneto region, Genoa, and Florence have submitted applications. Corsica, the only department that has not hosted a start, has been mentioned for 2013. 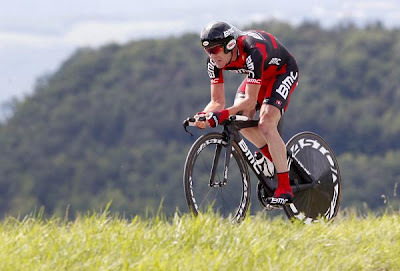 Cadel Evans (BMC) shattered Andy Schleck and Fränk Schleck (Leopard Trek) on the roads of Grenoble in the 42.5 km individual time trial and will wear the yellow jersey going into Paris tomorrow. “It’s not over until I cross the finish line in Paris, I hope it’s not raining,” Evans said after the finish. 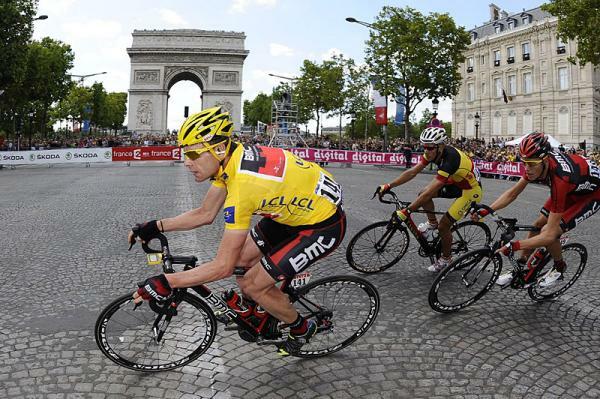 Evans had a deficit of 57 seconds to Andy Schleck and 4 seconds to Fränk Schleck before the start of the stage. By the end of the day it was Evans in the lead and the deficits belonged to Andy at 0:01:34 and Fränk at 0:02:30. Evans was fast enough to almost win the stage, coming in 2nd to Tony Martin (HTC-Highroad) by 7 seconds. Both Thomas Voeckler and Alberto Contador had phenomenal time trials, Voeckler able to retain his 4th position on GC and Contador moving up into 5th. Both Damiano Cunego and Ivan Basso had poor time trials. Cunego lost two positions on GC, from 5th to 7th, while Ivan Basso remained in 8th. Congratulations also to George Hincapie who will become part of 9 winning Tour de France teams, assuming nothing unusual happens tomorrow. "It has been the tradition since 1975 for the Tour de France to end with a prestigious stage finish on the Champs-Élysées. At the start in Créteil, we will remember Laurent Fignon, who held a licence with the local club. In 1989, his duel with Greg LeMond maintained the suspense right to the finish, where Fignon was sure that he would be the winner. That was the only occasion that the final stage was run as a time trial. 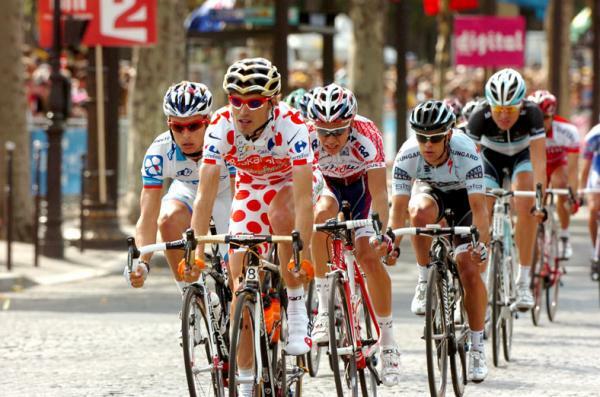 Every other time, it has been a road stage that has been decided in a bunch sprint, except on four occasions. Those exceptions were the victories taken by Alain Meslet in 1977, Bernard Hinault in 1979, Eddy Seigneur in 1994 and Alexandre Vinokourov in 2005. It is incredibly hard to get a telling gap on this stage when breakaway riders are always within sight of the peloton." Pierre Rolland (Team Europcar), Thomas Voeckler's constant aide, dropped Alberto Contador, and Samuel Sanchez to win stage 19 on the summit of Alpe d'Huez. It was France's first stage victory of the race, and the first time a French rider won on that summit since Bernard Hinault won in 1986 (the year Rolland was born). "On the Galibier Voeckler told me: 'Don't worry about me any more.' I realized that I could play my own card. I wanted to get a gap going onto the final climb, which is an ascent I know extremely well. I climbed it 10 times during a training camp. When I got to bend number one I knew that I could put it in the big ring and ride à bloc to the finish." Rolland also became the leader of the Young rider (white jersey) competition. "Looking at the riders that reached the arrival with me in this tough stage, reading the overall standing, I can only think to myself that my team and I are performing a very, very good Tour de France," Cunego explained. "Today's stage was very dangerous, and in fact, many tried a big attack. I preferred to race like I have been until now and the results were satisfactory today too. I decreased my pace for a while at 10 km to go, but then I quickly recovered energies and I could pedal with the Schlecks and with Evans, trying also to attack in the final part of the climb since I felt my energies were good. I'll face tomorrow time trial with top morale, I'll give my best". "This is the race’s only individual time trial, as the one in the first week was a team time trial test, while putting another one into the middle of the race didn’t really serve any great purpose. The profile is rolling and the road does climb, although there aren’t any cols as such. Victory won’t automatically go to a specialist because the final time trial of the Tour is a very physical test that suits a strong man – last year’s Bordeaux-Pauillac test won by Cancellara was an exception. 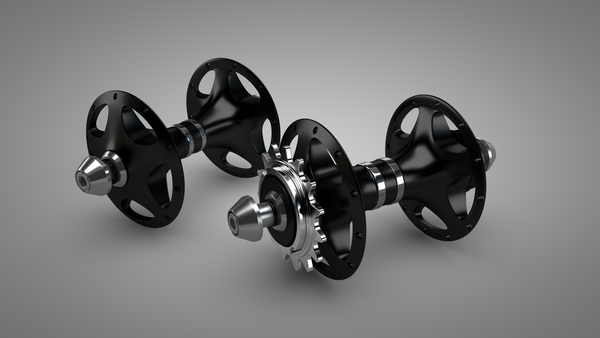 In this solitary exercise, there is no way a rider can bluff or hide in the wheels of their team-mates." 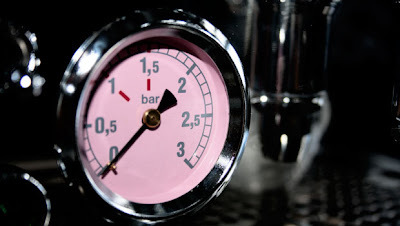 "57 seconds is a very narrow margin. Cadel Evans has always proved to be a superior rider in the time trial. But I really can't make any prognosis because it's so tight between them that we'll have to wait until tomorrow to find out!". 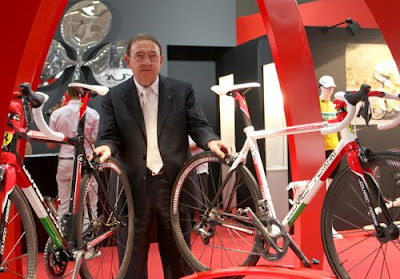 As we reported earlier, here, Angelo Zomegnan will no longer be the Director of the Giro d'Italia. The announcement of the new management organization for the Giro d'Italia will be made on Monday. 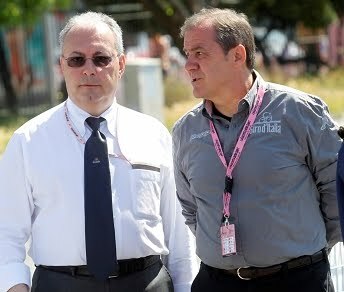 Michele Acquarone, currently Direttore Generale of RCS Sports, is said to be the new Director of the corsa rosa. 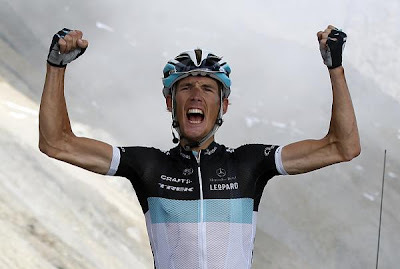 Andy Schleck (Leopard Trek) surprised all the GC contenders by executing a perfect Leopard Trek strategy in which he attacked early on the Col d'Izoard, 60 km from the finish, which led to stage victory atop the Galibier and a small 15 second deficit to a courageous Thomas Voeckler. Arriving second was brother Fränk followed by Cadel Evans (BMC). Of Schleck's attack from the GC group the group must have been thinking, "He's crazy" and "We will catch him on the Galibier". 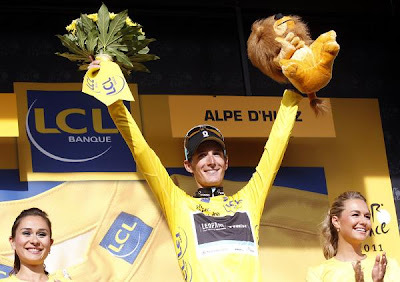 But Andy Schleck had other plans, one that he had been thinking about for a few days. In a breakaway group, ahead of the GC group, were two Leopard Trek riders: Poosthuma and Monfort. When Andy Schleck attacked he first bridged to Poosthuma. Then, at the start of the Izoard descent he bridged to Monfort who then sacrificed himself for Andy until 17 km to the finish. From there it was up to Schleck to maintain his lead of approximately 4 minutes. By the summit he had lost some of that time to Evans, Basso, Voeckler, Cunego and Fränk Schleck (who was happy to follow until the final meters when he sprinted for 2nd); Alberto Contador could not stay in contact. "This is a dream come true," said Andy Schleck. "I am very proud of this win. I like to have a plan and I like even more when it works out like that. The team has worked incredibly so far in this Tour. I said this morning 'no guts, no glory'. I took the race by the horns and went all in. I just tried to concentrate on the pain I had in my legs, and believe me I had a lot. Without Maxime (Monfort) this wouldn't be possible. We've been working a lot to get a win like this. Without these guys, it would not have been possible. Now I'm in second overall and it's a perfect position for tomorrow." 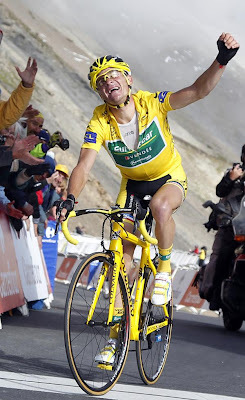 Thomas Voeckler keeps the yellow jersey, for the 10th day (same as 2004). “I lacked oxygen, it was hard for me to recover, my legs hurt badly,” said Voeckler. "On three occasions, I lost some seconds but from different riders, that’s why I’m still in yellow. I wasn’t aware of the time gaps when I was climbing the Galibier. I got to know at the top that I was three minutes behind Schleck with 3km to go. 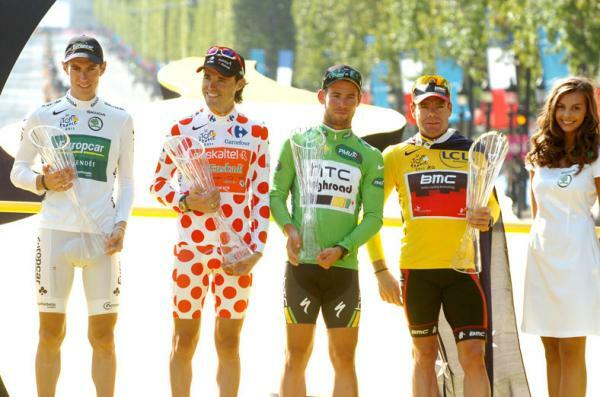 It was my goal to keep the jersey today but it didn’t depend on me but also on what the other riders were doing. I suffered but I followed the favorites. To keep the yellow jersey was beyond my expectations at Luz-Ardiden, then again at the Plateau de Beille, and now here at the Galibier. I’m not the kind of guy to congratulate myself. I do my job. I give everything. I can’t guarantee anything else to the fans other than the fact that I’m fighting. The suffering is enormous." "This was queen stage of this Tour and in effect the race was very tough but also very interesting," said Damiano Cunego. "Me and all the other riders made huge efforts, but at the end of the stage I received a very pleasant prize: 5th place in the overall standings. This position gives me even more morale for facing the next stage. Tomorrow, Alpe d'Huez will be another key moment of the Grande Boucle and I hope to quickly recover my energy because the stage will be short and very tough, a very dangerous mix". Ivan Basso, now 6th in GC with he same time as Cunego (Cunego 5th due to a better position in points classification), said, "For me, it was a good stage, arriving with the strongest in the front chasing group. Nothing special, but it was a good stage. Schleck attacked very strongly. You have to evaluate it in the moment. Sometimes you chase, sometimes you don't. I believe that knowing the tactical choice, the strongest rider won. Now, I'll rest a bit. Tomorrow's another day, two truly tough climbs, but you've seen that today some riders have suffered so everything is still possible. I have to be realistic. I can't talk any longer about the yellow jersey, but it's an important sign. I feel, until now, I've given the best of my possibilities." "Today’s route runs in the opposite direction to yesterday’s. The riders tackle the successive climbs of the Col du Télégraphe and the Galibier, and then finish with the climb to Alpe d’Huez, which returns after an absence of three years. It is a short stage. 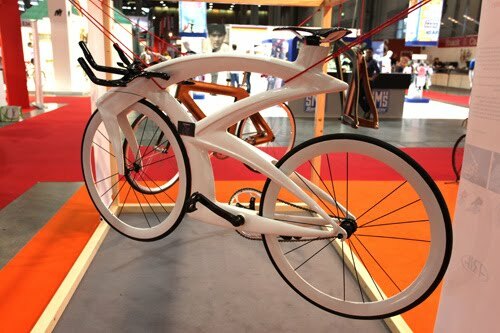 Nevertheless, all of the riders will be afraid of it. Those who aren’t going so well will be concerned about the cut-off time for elimination and the favorites will know that they will pay a heavy cost for any sign of weakness. The shortness of the stage allows the climbers to attack from very early on, which is not something they will be used to. This stage will be thrilling and, bearing in mind that it comes on the back of two other tough days, there is a chance that a lot of damage will be done today."